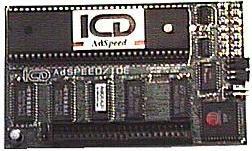 An accelerator which sits in the CPU socket of the A500 and A2000. It probably also works with the A1000 but this has not been confirmed. The card also contains 32K of SRAM which acts as some sort of cache. The card also includes a 2.5" IDE connector. It is not clear how this card differs from the AdSpeed/Novia or the AdSpeed/Prima or whether they were simply different names for the same card. Page contributors: David Wright, RawHeadX.